Beresford doesn’t remember much about his past or how he came to live in the chutes and crawl spaces of the posh high-rise that shares his name. But when rock star and teen sensation Melody McGrath moves to an apartment on the fiftieth floor, he knows he has to be near her. Although she doesn’t realize it, Melody is threatened by more dangerous forces than her manipulative stage mom and the pressures of life in the spotlight. The owner of the glamorous building has been hiding a fatal secret within its walls, and Beresford puts all his plans at risk. Will Beresford and Melody be able to escape with their lives (and love) intact? This book would make a great addition under the Christmas tree. The author begins with a prologue that will help explain the next events in the book. A small boy and his father are exploring a building in Los Angeles when they are interrupted by a man clearly trying to do them harm. What happens next is slightly unsettling and leaves the small boy with no recourse but to stay where he is-for years. Melody is a bit of a rock star on the rise. She moves to Los Angeles to further her career, though she isn't particularly happy about the move. She ends up in the exact same building as Beresford-the small boy from the prologue. Beresford is used to hiding from other humans and continues that practice with Melody. However, his tactic scares her on more than one occasion and their relationship is off to a nonexistent, rocky start. Melody as a character was fun to read about. The author made her sound and act like a teenage rock star sensation would act, she is a believable character. Can she be whiny? Sure. Can she be kind? Of course. 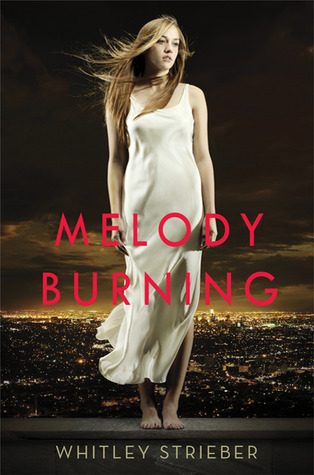 Melody is a flawed character, but that characteristic should appeal more to readers than that perfect teen rock star. Beresford is an intriguing enigma. The reader does not know much about his background and it appears Beresford is as much in the dark about that as the reader. He has definitely taken a liking to Melody, mostly because of her voice, at first. The book mainly focuses on these two characters, relegating the secondary characters to "background" for most of the novel-though not all of the secondary characters will stay in the background in the later portions. Overall, this book was an interesting mystery with hints of romance. The characters were likable, the events contained an undercurrent of suspense, and the ending was perfect-wouldn't change a thing. This book is recommended to teen/young adult readers. Oh wow this sounds good!!! I love how you describe the protagonist. Flaws are a must to make believable characters! Awesome review! Thanks! I really liked Melody, she came off as "real" rather than that typical rock star facade. Sounds really good!!! Great review! Thank you! I really enjoyed this book.